Yesterday it was time to start cleaning out the freezer, before we once again lose power in a winter storm. Halfway into the freezer, we found a package of boneless, skinless, chicken thighs. It was to be chicken for dinner again, but I craved something different and didn’t feel like standing over a stove, so it would be baked or broiled. In the mood for flavor and crunch, I opted for marinated and broiled. A perusal of the refrigerator and pantry revealed eight standby items with which to prepare a marinade. The result, accompanied by sautéed spinach, was excellent. Active preparation – 20 minutes. Total time – 1 hour & 45 minutes. 1.25 lbs. boneless, skinless chicken thighs, about 6 thighs. 1. Prepare the marinade: add the first 4 ingredients to a small bowl and whisk briskly, then add the next four and whisk again. 2. Place the defrosted chicken pieces in a mid-sized bowl. 3. Pour the marinade over the chicken and mix well. 4. Let the chicken marinate at room temperature for one hour, stir several times. 5. 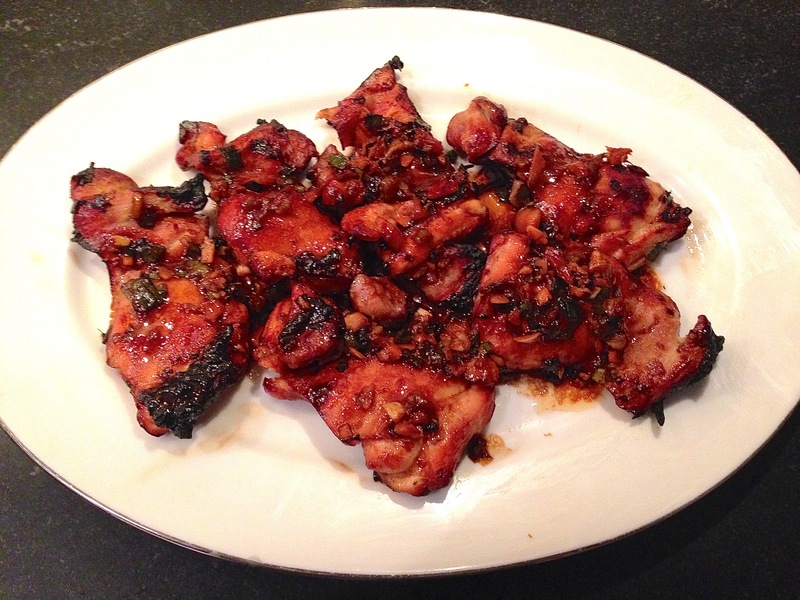 Place chicken thighs on a rack on a broiler pan, add few tablespoons of marinade to each piece. 6. Place pan about 6 inches from broiler element and cook 25 minutes turning once halfway through. Add remaining marinade after chicken has been turned. 7. Remove broiled chicken to serving platter and pour all of the pan drippings and juices over them. We found these great oven-proof soup bowls with handles at Williams-Sonoma a while back, and they have been sitting fallow in our cabinet ever since. But yesterday, with the weather turning to full Autumn here on Cape Cod, the bowls cried out to be used. Since they resemble those soup bowls one would see in un petit bistrot somewhere on La Rive Gauche, what better soup to christen them with than a hearty Soupe à l’Oignon. Betty whipped this up last night for a light supper, and with the lights turned down low, a candle on the dinner table, and Edith Piaf warbling in the background on the stereo, we enjoyed a 30 minute flight of fantasy to The City of Light. 2. In a large heavy pot, on medium heat, sauté the garlic in 4 tbsp of the butter. 3. Brush bread slices on both sides with the garlic butter mixture. 4. On a cookie sheet, bake the garlic bread in the oven for 6 minutes on each side, remove and set aside. Raise oven temperature to 375 degrees. 5. While the garlic bread is baking, add the remaining butter to the pot and melt, add onions and thyme sprigs, cook over medium heat until onions are well caramelized. 6. Remove the thyme sprigs, sift flour over the onions, mix well and cook over low heat for 8 minutes. Add sherry and continue cooking over low heat for 5 minutes more. 7. Add beef broth, salt and paper, bring to a boil and cook over medium heat for 20 minutes until thickened as desired. 8. 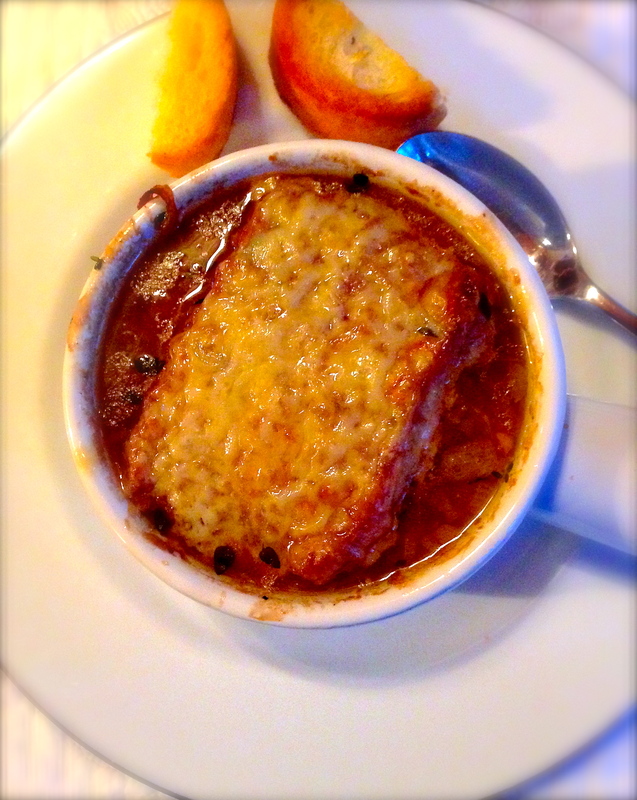 Place toasted garlic bread in soup bowls, add onion soup to the brim. 9. Cover bowls with layered Gruyere slices and place on a cookie sheet. Bake in 375 degree oven for 20 minutes.